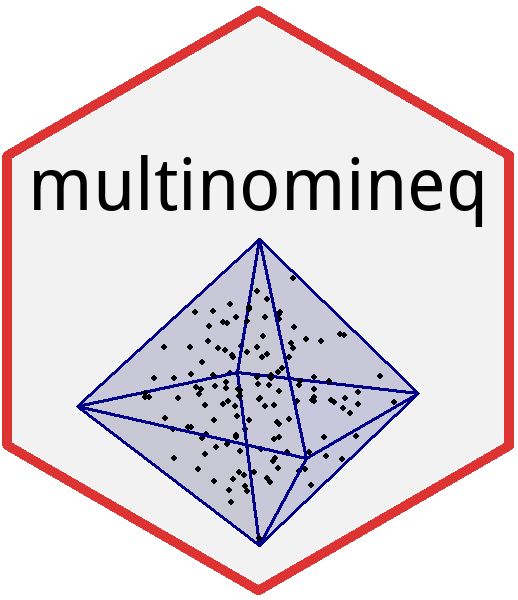 The R package multinomineq implements Gibbs sampling and Bayes factors for multinomial models with linear inequality constraints on the vector of probability parameters. As special cases, the model class includes models that predict a linear order of binomial probabilities (e.g., p < p < p < .50) and mixture models assuming that the parameter vector p must be inside the convex hull of a finite number of predicted patterns (i.e., vertices). Inequality-constrained multinomial models have applications in the area of judgment and decision making to fit and test random utility models (Regenwetter, M., Dana, J., & Davis-Stober, C.P. (2011). Transitivity of preferences. Psychological Review, 118, 42–56) or to perform outcome-based strategy classification to select the decision strategy that provides the best account for a vector of observed choice frequencies (Heck, D.W., Hilbig, B.E., & Moshagen, M. (2017). From information processing to decisions: Formalizing and comparing probabilistic choice models. Cognitive Psychology, 96, 26–40). The vignette is also available https://www.dwheck.de/vignettes/multinomineq_intro.html. Please cite this paper if you use multinomineq in publications.